56 HENRY is pleased to present Paintings From the Old World, an exhibition of new work by Rome-based artist Gianni Politi. The show, comprised of six unique shirts made from painted canvas, will be on view from January 13 through February 14, 2018. Paintings From the Old World marks Politi's first solo-exhibition in the United States. On view in the gallery is a set of six handmade shirts that hang directly from pegs on the wall. Gianni Politi produced each shirt with fragments of painted canvas that had accumulated on the floor of his studio. Carefully selecting each fragment for its color and texture, Politi sent his materials to a tailor, who sewed them into a series of classic men's dress shirts. 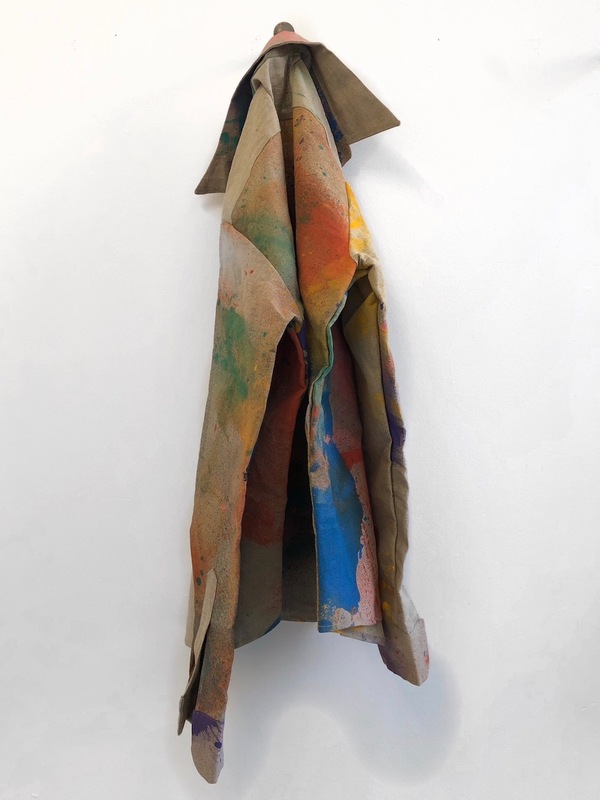 The raw, naturally colored linen of each garment appears to be soaked through with brightly saturated colors, and hung at their collars, the shirts fold over themselves to create unexpectedly layered compositions. To make these shirts, Politi engaged a working method similar to that which he uses to make his more traditional paintings. In earlier bodies of work, Politi affixed fragments of canvas from his studio floor on to the surface of his paintings, occluding sections of his compositions in order to construct jarring contrasts in color, form, and depth. In choosing to fabricate unique garments for exhibition, in lieu of a suite of paintings, Politi's presentation eschews traditional techniques in favor of works that engage the interaction between aesthetics and function. Conceived in part as portraits without subjects, Politi's shirts reflect simultaneously on the limits of painting and the beauty of a well-made shirt. Gianni Politi (b. 1986, Rome) lives and works in Rome, where he studied philosophy at Sapienza Universitá di Roma. Politi's work has been the subject of numerous solo presentations in Italy, including exhibitions at Palazzo Zino, Palermo; Castelo di Carini, Palermo, Galeria Lorcan O'Neill, Rome; Nomas Foundation, Rome; Galleria Nazionale di Arte Moderna, Roma; Instituto di Culture Italiano, Prague; CO2, Rome; Biblioteca Casanatense, Rome; and Palazzo Collicola arti visive, Spoleto. His work has also been included in major group presentations, including recent exhibitions at Museo di Castelvecchio, Verona; American Academy of Rome, Rome; AlbumArte, Rome and The Worbench, Milan. In 2018, Politi will have solo presentations at McNamara Art Foundation in Hong Kong and Fonderia Artistica Battaglia in Milan. Paintings From the Old World is Politi's first exhibition with 56 HENRY. Gianni Politi is represented by Galleria Lorcan O'Neill, Rome. Exhibitions at 56 HENRY are visible 24 hours a day. Gallery doors are open to the public Wednesday through Sunday, 12:00-6:00pm. For more information or images related to the exhibition, please contact Ellie Rines at (518) 966-2622 or info@56henry.nyc.